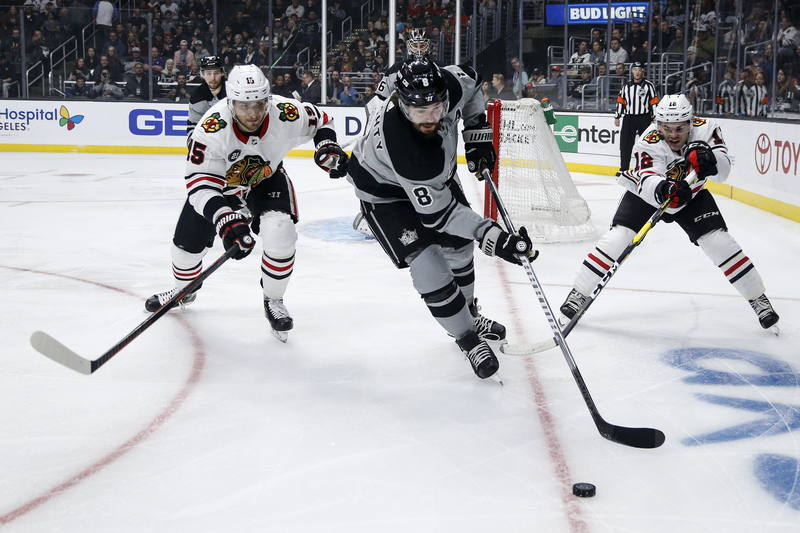 LOS ANGELES – Five games is all that remained for the Kings when they took the ice against the Chicago Blackhawks on Saturday night. Indeed, they are trying to show some class down the stretch, and they were looking for more of that against the Blackhawks. Chicago took a 1-0 lead at 1:38 of the second period on Alex DeBrincat’s 41st goal of the season. The puck might have gone in off the stick of a Kings player. Officially, assists went to Patrick Kane and Artem Anisimov. That goal was not nearly as electrifying as the one scored by Kings rookie Austin Wagner to tie the game at 16:05 of the period. The Blackhawks took a 2-1 lead at 3:09 of the third period on Gustafsson’s 17th of the season. Gustafsson scored on a long shot that seemed to disappear past goalie Jack Campbell, who barely reacted as if to suggest he was screened and didn’t see the puck. There was no scoring in the first period, but the Kings had a couple of good opportunities on the first of their two power-play opportunities in the period. But Crawford was up to the challenge, stopping shots by Kyle Clifford and Alec Martinez. The Kings outshot the Blackhawks 14-9 in the first 20 minutes. Also Monday, Kings captain Anze Kopitar will play in his 1,000th career game for the Kings.